Society sure has come a long way since “turn left at the tree and go up the big hill.” Or for people who live in places like Atlanta “Turn off of Peach Tree Way to Peach Tree St. Head four blocks past Peach Tree Lane and take a right onto Peach Tree Boulevard.” Of all the pain points technology has decreased for us over the years, GPS navigation is one of the most pervasive – and most loved of those technologies. But How Does GPS Work? First, it’s interesting to note that you do not “have GPS” you have access to GPS via a GPS receiver. GPS itself is the Global Positioning System. The GPS is actually made up of 24 active satellites orbiting the Earth, with another 3 in orbit as fail-safes should others experience problems. 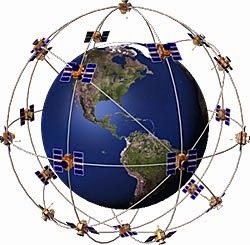 These GPS satellites circle the earth twice each day and transmit signals to Earth. GPS was originally developed and implemented as a military navigation system in the 70s, but was made available for use by civilians in 1983 by then-president Ronald Reagan. Civilian signals, however, were intentionally degraded in quality until May 1, 2000 by President Clinton. The orbits are arranged so that at any time, anywhere on Earth, there are at least four satellites “visible” in the sky. The signal these satellites transmit are low power radio signals. Civilians use the L1 frequency and can receive a signal from GPS only via line of sight. While the signal will pass through clouds or lighter weight objects – buildings and mountains tend to get in the way. Each signal contains 3 codes. One code identifies the satellite itself. The second transmits the status of the satellite including the date and time. The third code is the Almanac data which tells the receiver where that satellite should be at any given time. A receiver uses this data from each of the satellites to determine your distance from each of those satellites. Your distance from each of those known points tells the receiver the point of your location. As far as telecommunications go… GPS is hands down one of the coolest inventions since the telephone – both amazingly simply – and astoundingly elaborate in its construction. Have you ever gotten mad at your GPS for not working right?